Hello friends! I’ve been busy lately enjoying my May 2016 Card Kit from Simon – playing with images from the stamp set, trying various coloring techniques and using different coloring mediums. So far watercolor is still my favorite. 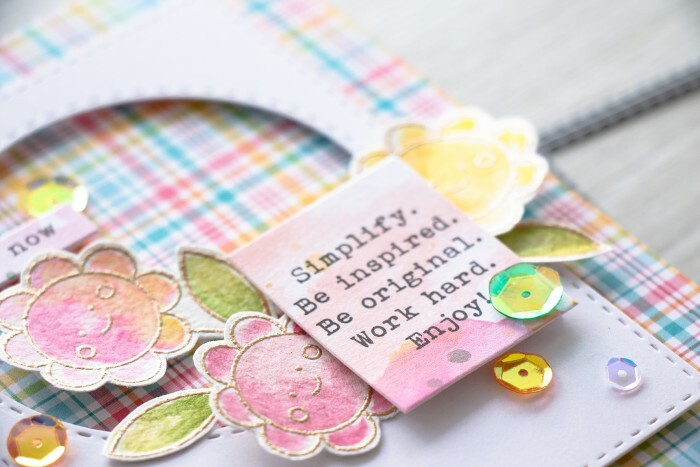 I have a card I’d like to share using heat embossing, loose watercoloring and a bit of die cutting. 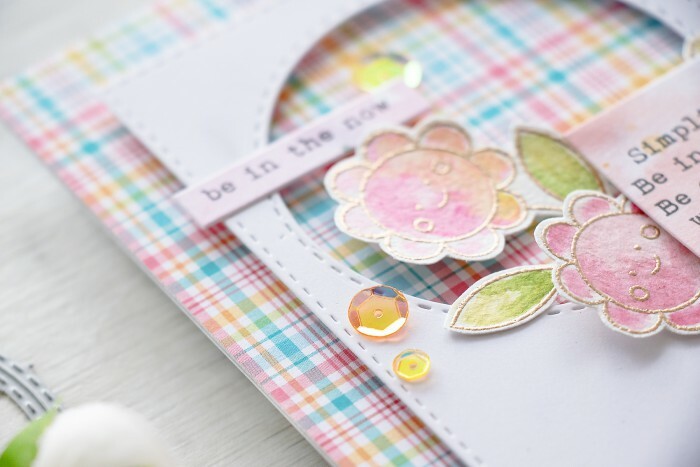 I started by covering the front of an A2 card with one of the plaid pattern papers from the kit and die cutting a rectangular panel with a circle opening out of white cardstock, panel was foam mounted onto the card. I am all out of Arches watercolor paper (I might have a few bits left, but I have a project in mind for them, so I’m saving them for now and I haven’t ordered a new pack yet) so I used my other watercolor paper and heat embossed several flower images in Rose Gold embossing powder and loosely watercolored using yellows, pinks and greens. My heat embossed flowers were fussy cut and grouped around a sentiment sticker which I foam mounted over the white die cut. 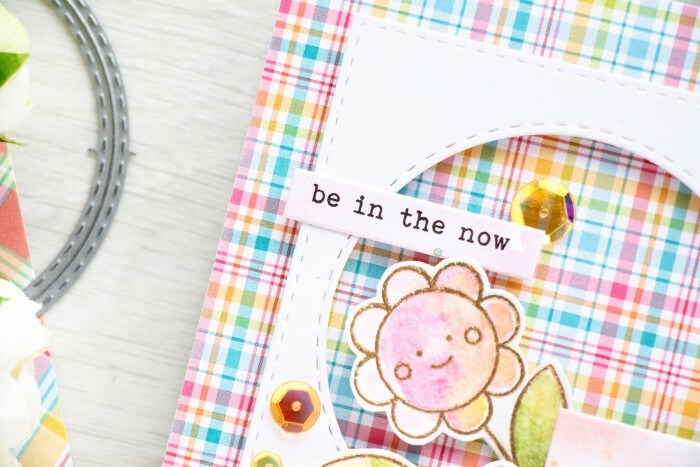 I also added one additional sentiment sticker – Be In The Now and adhered several sequins using a glue pen from the kit. You can subscribe to Simon Says Stamp card kit of the month program for $24.95 plus shipping and handling. 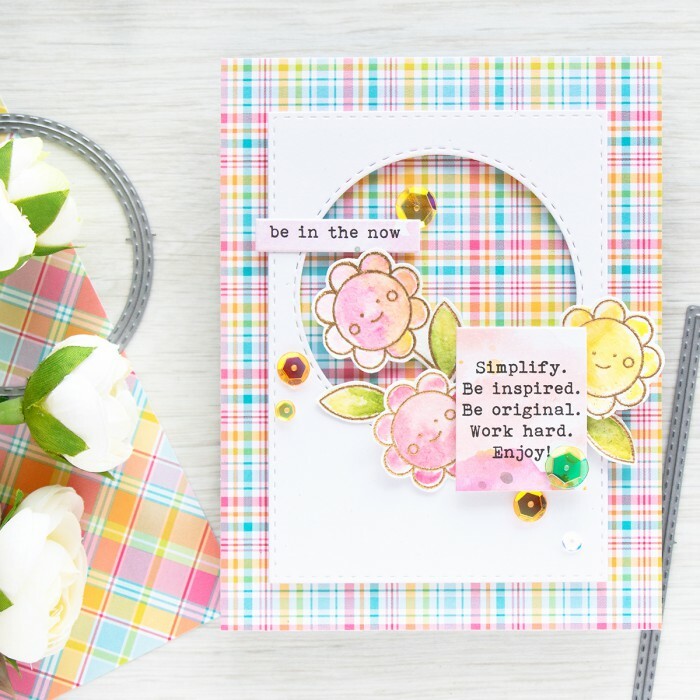 Kits can also be purchased individually at Simon Says Stamp store for $29.95 plus Shipping and Handling, you can also purchase many of the elements of the kit separately. I love your card ! I like very much the pattern and the colors of the paper and those flowers are so cute ! And the result all together with the embellishment is just gorgeous. Thanks for sharing. I love your card. It’s so intricate looking and looks like it would be fun to do. Thanks for sharing.